John Grier Hibben, from Peoria, Illinois, was valedictorian and president of the Class of 1882. He continued his studies in Berlin and at the Princeton Theological Seminary and, after four years as a parish minister, returned to the University as a graduate student in philosophy. Later, he became professor of logic and also taught psychology and the Bible. The search for a successor to Woodrow Wilson was a long and painful one. Hibben’s election came at the hands of trustees who had most resisted Wilson’s reforms. “My administration must make for peace,” he said. “I represent no group or set of men, no party, no faction, no past allegiance or affiliation — but one united Princeton!” Hibben practiced what he preached. One of his first acts was to befriend faculty members who belonged to the Wilson faction. Soon after taking office, he presided over the opening of the new Graduate College, the peaceful compound for scholars set on a hill beyond the golf course. At the dedication ceremony, he made special reference to the high-soaring Gothic tower built by popular subscription as the nation’s memorial to Grover Cleveland — who, after leaving the White House, retired to Princeton and became a trustee of the University. * John Aikman Stewart served as acting president from 1910 to 1912. 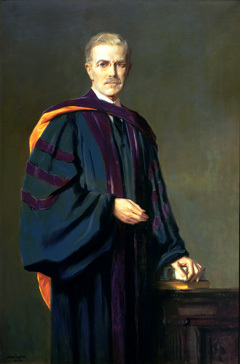 John Grier Hibben (1861–1933), Class of 1882, Ph.D. 1893.